With India being one of the fastest growing economies in the world, digitalisation of the country is essential, especially given our vast population and wide geography. As the saying goes, information is knowledge and knowledge is power. ‘Information’ is the most dynamic tool, which propels empowerment of the underserved sections of the society. Yet, 72 per cent of Indian women do not own mobile phones in the country, according to a GSMA report from 2016 titled Connected Women. Can you imagine a day without your smartphone or any digital tool for that matter? Probably no! Ownership of digital tools, especially mobile phones, empowers women; and this sense of ownership helps them to come out of the shackles of patriarchal dominance. Women need to be connected more and communicate more. We need to see digitisation from a gendered perspective. Women empowerment in rural areas is the need of the hour. With the motto ‘Inform, Communicate and Empower’, DEF has been trying to educate women in digital literacy. We’ve seen women confined into the four-walls of their houses, having nominal to zero exposure of the outside world, covering themselves up in veil. The first thing needed was the empowerment of minds and thought process. One of the major goals was to ensure that digital interventions strengthen grassroots democracy, improve governance, bring efficiency in delivery of government services and give voice to the people. In partnership with Quacomm, DEF initiated SoochnaPreneur project in 2017. Under this project, people were identified as Information Entrepreneurs and equipped with an Android app (MeraApp) that has a catalogue of welfare schemes and information about the same. The prime objective was to enable people in rural India to be empowered enough to access government entitlements and benefits. 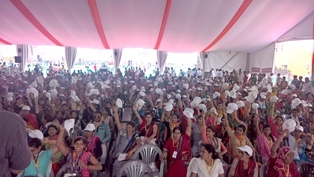 In the first phase, there were merely 40 per cent women among the hundred Information Agents. In Phase II, SoochnaPreneur engaged 100 women exclusively across the country to be trained in digital tools, deliverance of the same to the people and helping people to be digitally literate. Equipped with a smartphone and MeraApp, these women have broken all the barriers to become the agents of change. At par with Digital India, e-Sakhi initiative was launched by Rajasthan Government to train 1.5 lakh women to make them digital torchbearers of the state. In the e-Sakhi training held on July 26-27, 21 female SoochnaPreneurs were selected by the government to be e-Sakhis. They will be responsible to digitally literate a minimum of one member from each family in rural areas. DEF was one of the stakeholders for the e-Sakhi training programme at Bikaner Digifest. Saurabh Srivastava from DEF’s Governance & Citizen Services division conducted a session about internet and it’s usability through edutainment method. The e-Sakhis were included in the activity. It was conducted to explain the concept of Internet and how the information is transferred from one person to another. The training also included explanation regarding positive use of digital tools like social media and search engines. From being restrained to their houses in the most backward of districts in the country to not just being empowered themselves but also empowering other women and youth in their respective communities, these women SoochnaPreneurs have come a long way. Today with DEF’s intervention, these SoochnaPreneurs were able to reach to reach out close to 80,000 people and connected to 10,000 people for the benefits. Not just that, the main change that these women brought in is the change in the mentality of the people. From not owning a mobile to today having knowledge of wireless printing, laptop usage and many more, the women SoochnaPreneurs are true a force accelerating digital change towards a digital India.